Yoga is old. Really old. The word itself is a marvel to etymology, because of its origins in Vedic Sanskrit, the mother language of Sanskrit. In this context, yoga means union, joining, or adding, more particularly in the use yoking oxen and horses. In epic Sanskrit, the word evolves into a combination, connection, application, or conjunction. Both yujir yoga (to yoke) and yuj samādhau (to concentrate) are the sources for the word yoga according to Pāṇini, a 6th-century BCE Sanskrit grammarian. In the modern world, most would agree that yoga is the attempt to realize and unite with the divine and communion with all living beings. Yoga could be anywhere from 2500 years old to 3500 years old, but the real answer is that we don’t quite know. The analysts are unable to make a conclusion because of the lack of knowledge surrounding the Indus Valley language. But, it is possibly that this is an early version of Shiva. The relationship of the figure to the animals is unknown, but widely speculated upon. One thing we can definitely agree on is the seated position of the figure, so some type of postural study, possibly religious, was occurring at the time. 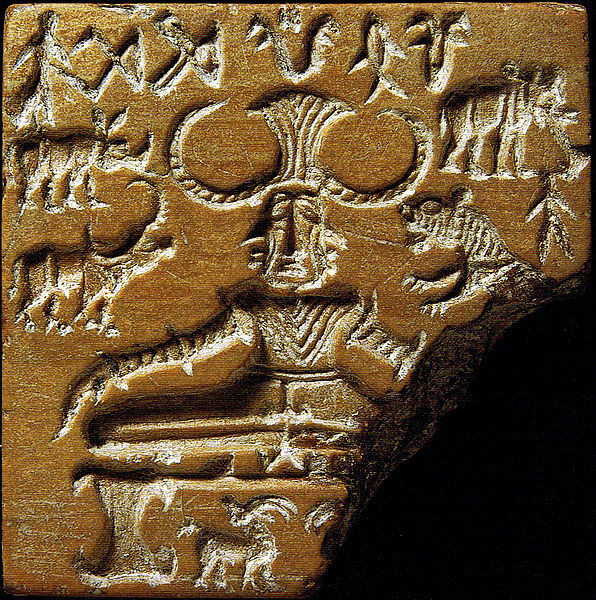 Whether the Indus Valley civilization practiced yoga, we start to see the Vedas spread between 1500BC and 500BC, which is where yoga and mantras start to become popular. The Rigveda is considered by many to be the oldest, but was surely a huge step for the spread of yoga. So it is at least 2500 years old, surely older, but no one really knows how much older, or how widespread it was. The beauty of yoga’s history is its connection to other religious traditions and human history. Between 200 BCE–500 CE philosophical schools of Hinduism, Buddhism and Jainism were taking form and a coherent philosophical system of yoga began to emerge. Even before that yoga was practiced and appreciation, if not worship, of animals in connection to the spiritual has been the foundational findings of anthropology and study of the ancient world. Sanskrit words for poses were created later, but poses were given names of animals far before Darwin and modern science arrived leading to the possibility that ancient yogis, or Rishis (truth speakers) knew about concepts of evolution. Because yoga is ancient, its origin is often obscured, but we are sure that civilization gave birth to the practices and beliefs. What has evolved into asana, relaxation, breathing exercises, and detached meditation we know as yoga started with the most ancient of philosophies and religious practices thousands of years ago.